What is in the works for Town Center East, located at 1001 and 1101 3rd Street SW (map), has been adjusted significantly since last spring, when the original buildings were designated as historically significant by HPRB. Since then, The Bernstein Companies has been working with the Historic Preservation Office to come up with a development plan that protects the buildings and grounds, which were designed by I.M. Pei. Originally, plans called for building two high-rise structures on what are now parking lots, and the construction of a smaller residential project in between the existing buildings. Now, the smaller building in the open space has been nixed. The existing north building will be rehabilitated, and the open space will be redesigned with a semicircular walkway and lawn. Two 11-story apartment buildings will still be built on the parking lots and will be parallel to the existing buildings. The new residential buildings will have 356 units in total. 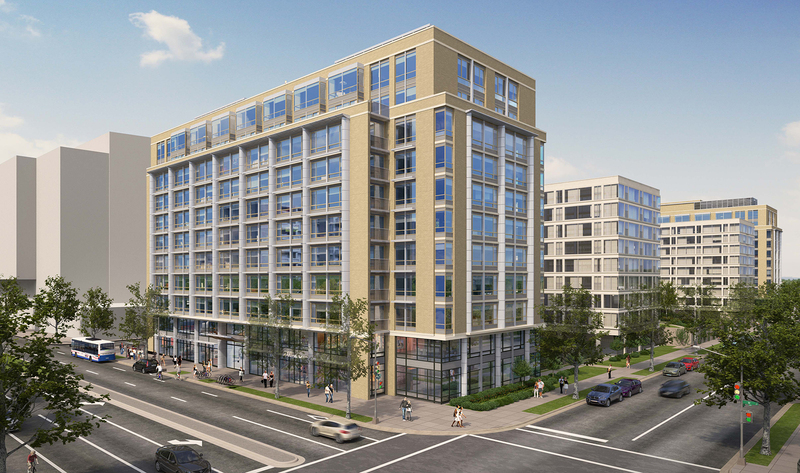 The Historic Preservation Office supported the newest plans, and according to Southwest…The Little Quadrant That Could, ANC 6D threw their conditional support behind the plans earlier this month. The developers will be going before the Zoning Commission in October.